Special task force honoured for combating virulent batch of the drug Spice | News by Wales Express News, People Before Profit! 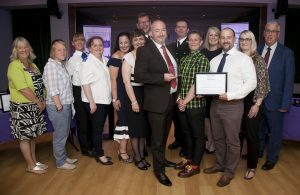 A special taskforce born when a virulent batch of the synthetic drug Spice hit the streets of Wrexham in April last year has won a major award. Then authorities in the town ruled enough was enough and decided something had to be done to tackle the worsening problem. Pictured presenting the Drug Intervention Award to the Wrexham NPS Task Force is North Wales Police and Crime Commissioner Arfon Jones with, from left, Deputy Commissioner Ann Griffith, Katie Harman, NACRO; PCSO Stacey Hughes, Karen Edwards, Salvation Army; Tanya Jones, The Wallich; Rhian Jones, Wrexham County Borough Council; Inspector Paul Wycherley; Steve Campbell, Cais; PC Dave Evans; Wendy Baker and Dr Karen Sankey, Betsi Cadwaladr Community Health Board; Paul Thorpe and Tracey Sutton, both Wrexham County Borough Council. That led to the creation of the taskforce which has a particular focus on Wrexham’s homelessness problem and an addiction to the cheaply manufactured Spice and Mamba which so often accompanies it. 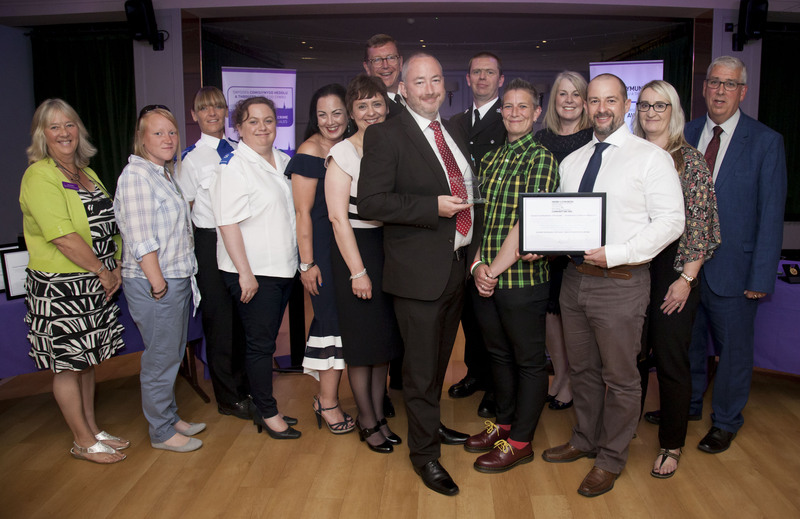 Now the taskforce has been presented with the Drug Intervention Award by North Wales Police and Crime Commissioner Arfon Jones at his annual Community Awards ceremony at the Celtic Royal Hotel, in Caernarfon. The New Psychoactive Substances (NPS) team is coordinated by Steve Campbell, who works for the charity CAIS based at Champions House in Wrexham, and it includes among its members representatives of Wrexham County Borough Council, North Wales Police, and Betsi Cadwaladr University Health Board. Steve, currently seconded three days a week to Wrexham Council, said a survey of 63 homeless people in the town in May revealed that addiction to Spice and Mamba is now higher than addiction to heroin. He says Spice and Mamba are ‘synthetic cannabinoids’ which are chemicals trying to mimic the effects of cannabis. The one-time legal highs were outlawed in 2016. “They are far more harmful than cannabis,” he said. “The homeless, the visible, vulnerable group, use it because it so cheap. Arfon Jones said: “It is all very well to set out on the road to recovery but you need stability in your life to continue along that road so I welcome the involvement of Housing and the Department of Work and Pensions as well as the excellent work Dr Karen Sankey is doing and the involvement of The Wallich homeless charity with last year’s award-winner Tanya Jones. Steve says a survey last November discovered there were 44 rough sleepers on the streets of Wrexham. “I was surprised the figure was so high,” Steve admitted. “I was expecting the number to be nearer 30, certainly below 40. CAIS is a registered charity in Wales which helps people having problems with addictions, mental health, personal development and employment. It is committed to working in partnership with others, as in the case of the NPS taskforce, in keeping with the All Wales Strategy – Tackling Substance Misuse in Wales. Steve joined CAIS in 2011 after running his own catering business, working with the Wallich charity for the homeless, and volunteering with Chester Aid to the Homeless. He is currently its Partnerships and Business Development Manager. “The problem of homelessness, and so often its accompanying addiction to Spice and Mamba, is far from unique to Wrexham,” said Steve. “We attempt to assess the needs of the visible vulnerable group and if residential treatment is needed for Spice and Mamba addiction we have the Hafen Wen detox centre here in Wrexham. Among those named on the award citation are Dr Karen Sankey and Dewi Richards who are committed to a weekly care hub to deliver support to those in need who would not normally engage with services, heightening risk to themselves and others; Linda Evans and Catherine Marland from the Department of Work and Pensions who have provided previously blocked access to funds and services thereby bringing service users in from the cold; Paul Thorpe from Wrexham County Borough Council Outreach who is committed to helping people in need; Tracey Sutton from WCBC Gateway who delivers housing services as part of the CARE hub; Karen Edwards from the Salvation Army who provides a safe and relaxed venue several times a week; and Rowena Gregor from the Kaleidoscope organisation which counsels drug and alcohol addicts. The citation added: “There is a tangible and overwhelming sense of partnership engagement to find solutions to this challenging and complex issue. It also praised the “unsung multitude of individuals and agencies” engaged with the NPS taskforce.